Logistics needs intelligent and experienced management operations so that goods are at the right place at the right time – whether this involves groupage freight operations or complete loads, standard dimensions or special consignments, hazardous goods, bulk liquid and gas, regular or express services. Looking for a cargo delivery in Singapore? We transport your loads by truck from the ship to your retail customer, from your plant to your end consumer, from your local manufacturing cross the border to new frontiers using our widespread network. We are able to integrate complex distribution, including the dangerous goods transportation, warehouse management and last-mile delivery while providing the same passion and care for small- and medium-sized enterprises as for major corporations. 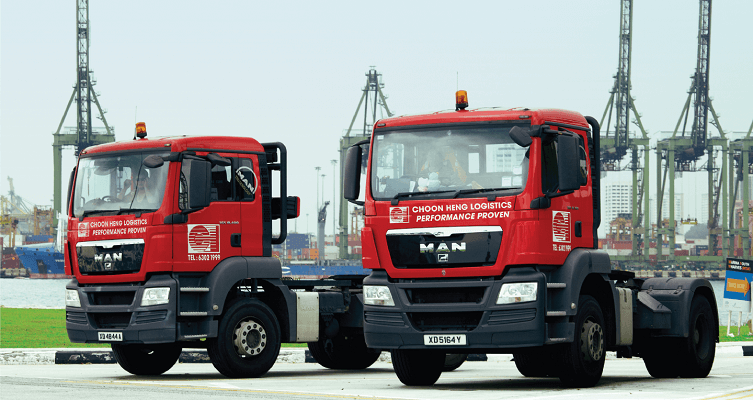 All Choon Heng trucks and warehousing locations are connected to the company’ central service centre so that it is possible to track the consignment at any time. This allows us and you to track transports and actively steer all the processes. Our logging system is also linked to a camera and GPS systems in order to protect goods from loss or theft, due to these factors, we have acquired a high place in trucking services Singapore. Depending on the task at hand, we offer you standardised products or tailor-made concepts to manage your supply chain and logistic needs including options like 40ft trucking, Project trucking,Tanker trucking and Container Trucking etc . We provide an impressive variety of equipment, vehicles and trailers for truck transport operations such as Bulk liquid trucking and Haulier services.. Our fleet consists of many kinds of vehicles for cross-border bulk and break-bulk transport, general container hauling, and transport of hazardous goods or oversized items – e.g. metals, building materials, minerals, agricultural goods, wood, chemicals, waste, liquid waste, and all types of products for the manufacturing, construction, or food industry, and so many more. Logistics services in every facet of the customer’s supply chains – e.g. the complete in- house management of hauling, warehousing, dispatch and handling departments for the manufacturing and freight forwarding industries, extensive management of building site logistics, managing landfill sites and even operating as the exclusive freight forwarder for factory supplies and the transport service operator for major oil and gas companies. Our service covers road transportation within the national borders and beyond borders. Our service lines are supported by a wide range of additional solutions like track & trace, Yard Storage, insurance, import-export customs procedures and packaging services. With our hard work and excellent management, we are the most recommended service providers in trucking services Singapore and particularly in the chemical trucking Singapore. Name your challenge. We will work with you to develop a safe and efficient transport concept and execution plan – whether this involves shutdown of your power plant, materials for a manufacturing site, or bulky structures for a building. We even executed complex turn-key projects involving dangerous liquids, gases and temperature-controlled pharmaceuticals. Turnkey projects are our domain as we are the specialists in turn-key logistics: We often handle the complete project logistics, including the planning, pick-up, and final delivery runs. We also offer many value-added services. We can pack your goods so that they are safe during transit; and we look after all the customs formalities, offer central warehouse space and even handle the installation work or unpacking of your goods right at your destination. So, if you are looking for a service that handles Jurong island delivery, we are the safest option for you in the port services Singapore. We keep our eye on the small details without losing sight of the big picture. Our container trucking services and chemical trucking services depict excellence in all of our performance. We know by experience, project logistics require meticulous and detailed preparation work, so that we can plan and execute for you in a professional and systematic way. Not every tunnel is wide enough and not every bridge is strong enough to be used by our heavy goods vehicles such as 40ft trucking, project tracking, tanker trucking and container trucking etc. That is why we call ourselves experts. We check and plan the routes before each shipment is transported, obtain the necessary permits and arrange the ideal preparation with partners and the authorities. Expect service from the A to Z..
Our warehouse logistics facilities ensure the seamless yard storage and management of your goods. You determine the requirements – e.g. the time, volume, sequence and packaging for your goods. For your sensitive goods we have temperature-controlled facilities. Choon Heng offers its customers flexible and expandable warehousing solutions and ideally integrates with your overall supply chain. The use of an outsourced warehouse service has cost benefits for small- and medium-sized companies and those who are affected by seasonal trends. cargo delivery Singapore is more than just delivering, it’s facilitating the needs of our clients. We employ a modern warehouse management system at our secured facilities in order to provide you with a constant overview of product movements and keep updated on the location of your goods. We can also integrate with your IT systems to help your planning and provide continuous data exchange..
You name the job. We have the specialised vehicle, equipment and facility as per the quality standards set by the port services and trucking services. All our vehicle are equipped with the latest GPS-based vehicle tracking and fleet management system. We are constantly updating our fleet with the latest technology which allows you real-time tracking and monitoring of the vehicles deployed for your transport. Our fleet consists of the most reputable continental truck brands DAF, SCANIA, and MAN. Further, our trucks are on average less than 5 years old. Our vast fleets undergoes continuous quality and service checks at the full-fledged maintenance yard of our subsidiary Ephraim Engineering. At Ephraim Engineering, our fleet is in the hands of well-trained and highly-skilled, mechanics and experts who ensure proper maintenance of our vehicles. The workshop has designated service stations and 12 repair bays. The truck parts distribution division of Ephraim Engineering is well-equipped with sufficient stock of tires, truck and trailer parts & other consumables for timely replenishment helping us attain the level of perfection in our bulk liquid trucking, chemical trucking services, and container trucking services. Our team ensures that the entire fleet of machinery is fully-maintained for every journey. We have fully-equipped road repair vans in case of an emergency. So when you work with us, you know you have the best DG cargo delivery, and the topmost option in cargo delivery in Singapore. Our location features our corporate office and customer service divisions, our fleet parking, container depot, warehouse with loading bays, and our subsidiaries with truck maintenance facilities, truck parts storage, and truck dealership. Our service center location is positioned to grow with your needs and demands. We have ample space to expand our facility and building up to manage your value-added services – be it operations and repair of vending machines, or inventory management. Our new centralized service center is where all our divisions and subsidiaries unite to integrate and offer holistic services to meet your complex needs. When you work with us on your logistics and transport needs, you benefit from a single point of contact at our service center. Further our specialized divisions and subsidiaries integrate tightly under one roof when serving you – which eliminates downtime and makes us a very holistic and efficient partner. Our centralized service center is strategically located in the center of Singapore’s industrial zones and next to the Singapore’s petrol-chemical zone of Jurong. 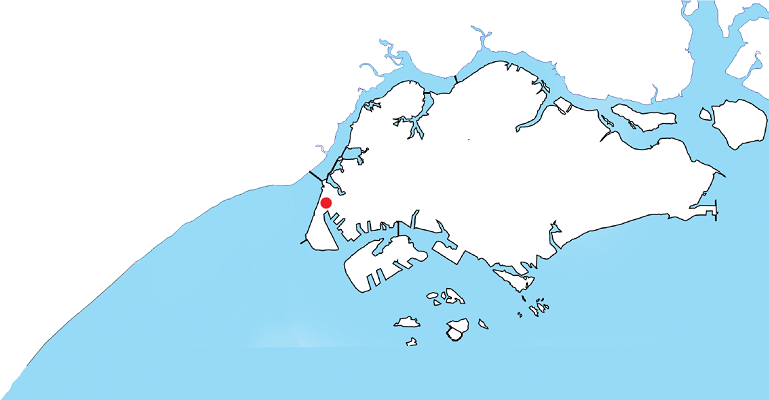 Our new facility with a land-lease of 40 years is next to the new main port of Singapore and the Tuas South MRT line. We have multiple entries and exits with only 8 minutes to the AYE Highway which makes us an ideal option for dangerous goods transportation, haulier services, trucking services, container trucking services and all logistic solutions. © Copyright 2016 Choon Heng Group Singapore. Theme by XtremelySocial.